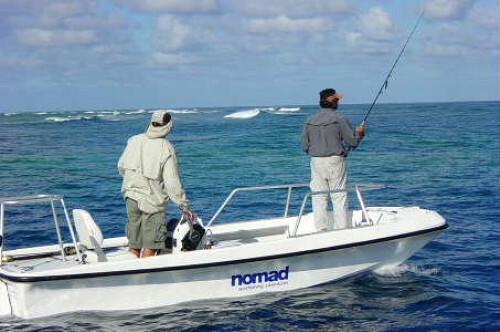 Nomad Sportfishing operates a unique 80ft Mothership and 6 sportsfishing boats (18-36ft) for fishing charters along the eastern Queensland Coastof Australia. 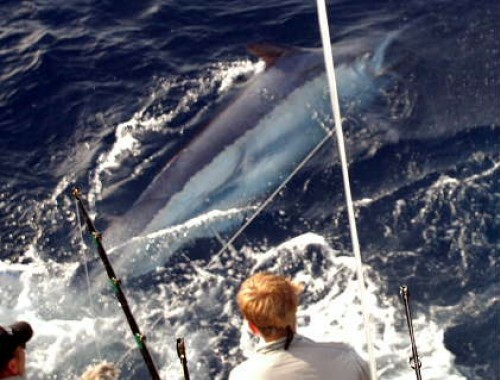 We specialise in sportfishing, gamefishing and flyfishing. 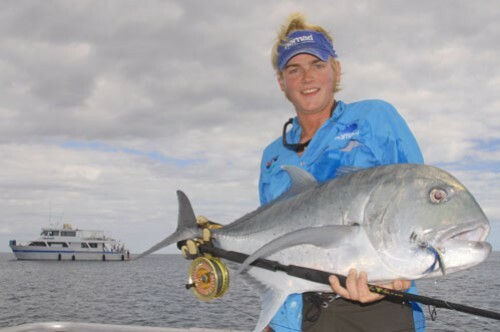 The aim is to provide the best blue water fishing holidays in Australia. Very few other charter companies can operate in the areas we can and we also have a floatplane for access to some of the submerged offshore atolls upto 300 miles form the coast. Our basic setup is for a 5 day/ 6 night adventure with 5 Full days fishing and 2 half days. These trips are based around the 80ft mothership whcih sales up and down the coast. Depending on where it is at any point in time will influence the areas we can fish. Getitng to the Mothership is by float plane form Hamilton Island. We do offer some trips whcih are shorter from Lizard Island and some that dont involve flying at all and instead use 1 night for transport. At the bottom you will see whats included and what to bring. It is very hard to capture all the details on this page so please press the “contact us” button to the right to get the information pack and DVD – as this is a full holiday and not just a day charter trip. Out of our trip styles, our Drive Out Specials and Lagoon Explorers are great for GT popper fishing and general light tackle Sportfishing while our 2-4 day Gameboat Trips and Ultimate Adventures are best for these fishing styles plus jigging for dogtooth tuna or catching wahoo, yellowfin tuna, sailfish or marlin. We visit a variety of destinations each year as you can see below. All trip packages include use of a range of top quality Shimano rods and reels throughout the trip, meals, accommodation, and non-alcoholic drinks, and you can book in as an individual, a small group or a whole boat booking. All 6-night trips use our 80ft mothership as the base and include keg beer on tap. This is our premium charter option, offering the ultimate diversity of fishing styles and species, as well as superior comfort onboard our 51ft gameboat, 2 x 25ft centre consoles and 1 x 18ft centre console. This option is best if you want to combine light tackle lurecasting, GT popping or general lagoon sportfishing with jigging for dogtooth tuna, trolling for wahoo, yellowfin tuna, sailfish or some heavy tackle marlin fishing. We cater for 12 anglers on these trips. Lagoon Explorers focus on general sportfishing, lurecasting and GT popper fishing for species such as GTs, coral trout, spanish mackerel, longtail tuna and a whole range of other sportfish. The locations that we visit on these trips provide more sheltered waters for our 2 x 18ft and 2 x 25ft centre consoles to operate in. We cater for 12 anglers on these trips. 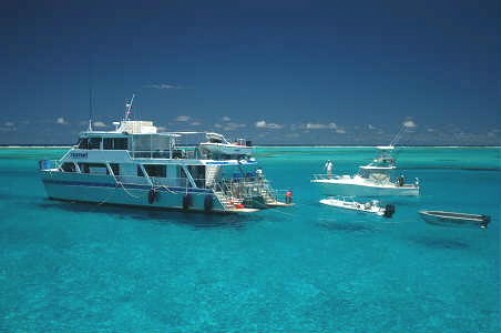 This is a new trip option, in response to strong demand for an entry level Coral Sea trip. Drive Out GT specials are very similar to the Lagoon Explorer trips, except that you access the reefs by driving out onboard our mothership rather than by floatplane, and we cater for 14 guests. These are a shorter trip of 2-4 days duration using our 51ft gameboat, and departing from Mackay, Cairns or Lockhart River. These trips cater to all fishing styles and species, depending on location, and are an excellent option for anglers with limited time available. We cater for 5 anglers onboard the gameboat. Maximum Passengers: Generall 12-14 but some trips are 5. See the text above. Departure Point: Hamilton Island mainly but some trips leave from other locations. See the text above. Accomodation : Onboard the mothership “Odyssey” there are either quad share cabins or double share cabins. Food: All food and non alcholic beverages are included. If you need any special dietary requirements then let us know in advance. Local tap beer is included. Clothing of course – remember it is the tropics but can be cool at night. Suntan cream as you are out on the water all day. If you want to bring your own gear then thats great as well. Email/Telephone – we have them onboard but they are expensive as they are via satellite. Nomad Sportfishing Adventures was started by a father and son team John and Damon Olsen in March 2000. They started at Fraser Island but by 2003 too many charters were being cancelled due to the weather even though the GT and Jigging niche market had been discovered. By 2005 after a lot of boat building the mothership was ready for the coral sea and the configuration of mothership and smaller vessels and floatplane was a reality. All of our vessels are custom made to suit the locations, conditions and the fishing methods and are maintained to the highest standards.